Yogi claimed that Prime Minister Narendra Modi had now become a brand all over the world to the extent that whenever he goes to attend international conferences in the presence of Presidents of other countries, the organisers request him to inaugurate the summit. “This is the way India is recognised in the world since 2014 when Modiji assumed command of the country. 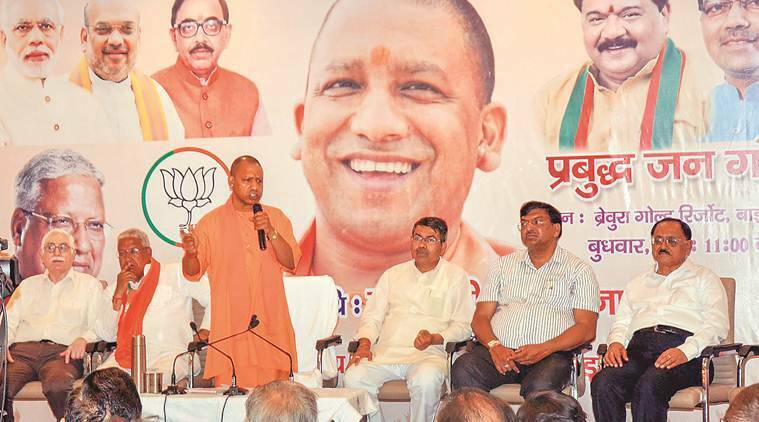 These NRIs told me that before 2014, they felt ashamed in giving their passports and other documents for scrutiny at airports as they were then treated with disdain by the immigration officials but their perspective in dealing with Indian nationals has changed in the past five years [under Modi’s rule],” said Yogi while addressing a seminar, ‘Prabudh Varg Goshti’. Yogi was referring to an interaction with NRIs during a summit held in Lucknow in January. He also claimed that the Prime Minister Narendra Modi had now become a brand all over the world to the extent that whenever our PM goes to attend international conferences in the presence of Presidents of other countries, the organisers request him (Modi) to inaugurate the summit. “Modiji ka koi vikalp nahi hai, unse yogya koi nahi hai (There is no alternative to Modiji and no one is more capable than him),” he said evoking applause from the gathering that mostly comprised BJP’s intellectual cell members and a few other prominent persons from Meerut. Yogi pointed out that he addressed two such meetings in Varanasi and Gorakhpur earlier and there would be more similar meetings before completion of the election process. Yogi said during from 2004 to 2014 (when UPA was in power) nearly 36,000 soldiers suffered injuries when locals pelted stones on them on a regular basis but the policy of the then government was that our jawans would not fire at them till they (stone-pelters) fire at them. “There has not been a single incident of stone-pelting in the Valley in the past two years, claimed Yogi. He said the Congress’s response to such incidents was that they would watch the developments and then take action which, however, was never taken but the Modi governments acts promptly. “After the attack on our jawans in Pulwama, our PM said the sacrifice of our soldiers would not go in vain and within two days of the incidents, those who planned the attack were killed by our armed forces,” claimed the CM. Citing a recent meeting with a Samajwadi Party MLC (who he did not name) at the CM’s office in Lucknow, Yogi said, “I asked him why he and his sons want to join the BJP now when the election process was already on, they replied that they were fed up with dynastic and caste politics of their party (SP) and now they are willing to serve the country (by joining the BJP). The SP MLC told me that whenever he comes back to his home, the women there ask him, “Tumhe sharm nahi aati jab goondon ki party ka jhanda apni car me lagate ho? (Do not you feel ashamed in putting up the flag of a party of anti-social elements on your car?) and hence he and his sons expressed their wish to join the BJP.